Ant-Man’s shrinking powers guarantee that his upcoming Marvel Studios film will have sequences unlike anything we’ve ever seen in a big budget superhero blockbuster - if not only because the very special locations the movie can use for action scenes. Case in point, there are two fantastic fight scenes in the feature that take place in two very odd locations: the inside of a briefcase falling out of a helicopter, and the bedroom of a little girl. It was when I visited the set of Ant-Man late last year in Atlanta, Georgia that I learned about these two sequences in the film – naturally raising my expectations for what director Peyton Reed is delivering next month. From what was described in interviews with Reed, as well as Marvel Studios President Kevin Feige (not to mention actually witnessed in near-finished footage), it seems like the sequences will truly be unlike anything movie fans have seen before. The start of the briefcase sequence actually begins in a helicopter where Scott Lang a.k.a. Ant-Man (Paul Rudd) first comes face-to-face with the central villain of the film: Darren Cross a.k.a. Yellow Jacket (Corey Stoll). Using his suit’s powerful weapons, Cross tries to kill Lang, but the reformed burglar is too quick and manages to evade the blasts by shrinking, leaping, and dodging. In the chaos, the pilot gets shot, and it’s the turbulence of the aircraft that winds up throwing both the hero and the villain into an open briefcase… which then shuts and locks them in. The case falls out of the copter’s door, and plummets down to the Earth below as the protagonist and antagonist continue to duel. I not only got to watch the filming of the beginning of this scene (described by Peyton Reed as "the first time they’ve seen the actual full scale Yellow Jacket in use"), but I also got to see the almost completed scene as part of a footage presentation, and it’s a blast. 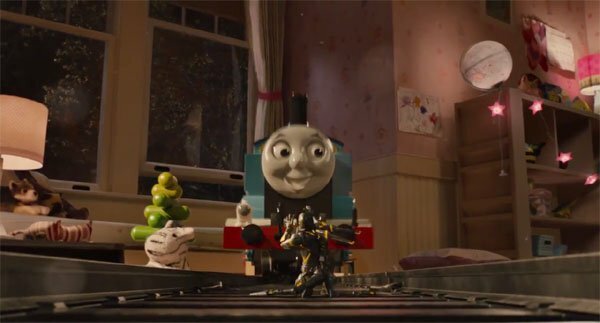 Everything you’ve seen up to this point in the movie, with what Yellow Jacket can do, what the Ant-Man suit can do, what the Pym particles can do to both shrink things and enlarge things, comes to a culmination in this little girl’s room - in a way that I think is going to make it one of the most unique finales we’ve ever had. It seems as though Ant-Man is being set up to be a special little film (pun totally intended), and we’re excited to see the full thing when it arrives in theaters July 17th.